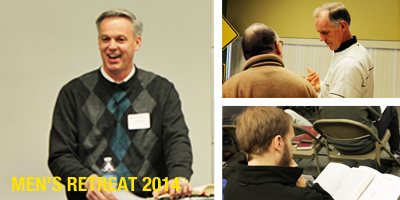 Without reservation I can say that Men’s Retreat 2014 was the best retreat I have seen at Grace Baptist Church. There was an excellent spirit in the men and a desire for God’s Word. Despite the winter temperatures and weather, the attendance was fabulous. Here are some of the reasons for a great retreat this past weekend. God’s Presence—We prayed and prepared for this retreat and God blessed us with His unmistakable presence. As the Word was preached I sensed that God was deeply working in our hearts as men. He helped us identify the challenges that we as men face in these days and how to overcome them. He showed us that we can live holy lives in an unholy world. He taught us how to walk in victory day by day. He led us to prayer for strength to be the men, husbands and fathers that we ought to be. It was awesome to see God work in my heart and in the hearts of our men in specific areas. Great Preaching—God promises to bless and use the preaching of the Word. We were blessed to have Pastor Dan Mawson, Senior Pastor at Victory Baptist Church in West Chester, PA, as our retreat speaker. His heart for God and enthusiastic preaching was a blessing. Good Music—There is nothing like a group of men singing praises to God. It is bold, heart felt and glorious. I love singing and was certainly moved by this year’s music. It was a blessing to sing songs of salvation, heaven, victory and praise. We sang that encouraging song I’m on the Winning Side reminding us that the Devil is a defeated foe and we stand with our God on the winning side. The men sang this song for the Sunday Morning Service as a testimony to our Lord. Godly Fellowship—Men are bombarded with the influence of the world on a daily basis and are often wearied with its temptations. The godly fellowship found at Men’s Retreat was refreshing and encouraging. If you missed Men’s Retreat 2014, I would encourage your to listen to the messages here and then make plans to attend next year, January 30-31 with Pastor Marc Monte. You will be glad you did! Until then, seek to be faithful to the Lord, to your wife, your family, and your church. The Devil is not playing games and neither should we. Let’s be men for God that make a difference by being different.